You are here: Home / Does Your Child Have Difficulties With Spoken Words? 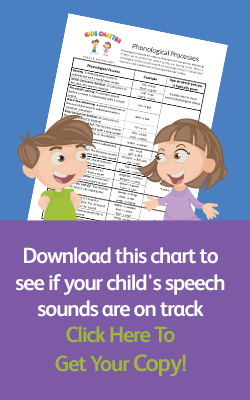 Does Your Child Have Difficulties With Spoken Words? If your child is struggling to express spoken words and sentences correctly, they may need Spoken Language Use Therapy. It’s not just about whether or not they are using grammatically correct sentences, but also whether children are able to express themselves using correct vocabulary: naming people, places or things, or being able to provide details and clear descriptions of events. They use “he” all the time regardless of whether they’re talking about a boy or a girl (or “she” all the time). If you ask them to name ten animals, they may struggle to name three or four. Other kids say your child speaks in “baby talk”. They have difficulties being able to label simple objects by their correct name. They have trouble telling you a story about something they experienced such as things they did at school or what they did at a friend’s house. Left untreated, this problem can have a serious impact on your child’s ability to communicate effectively with others as well as with their literacy skills. After all, we write the way we speak. They’ll struggle to write assignments at school as they will have difficulties describing things or putting them into a cohesive paragraph/story. If they don’t know how to write a paper at school/university or are simply not able to explain something to another person during a conversation or job interview, this will ultimately affect their career options in adulthood. When you bring them to Kids Chatter we’ll talk to your child, listen to their conversation and analyse their expressive language skills. We’ll see if they can construct sentences, stay on topic with whatever we’re discussing, and ask and answer questions using appropriate vocabulary and descriptions. We’ll also look at specific word structures. Are they using the right pronouns, tenses, plurals and so on? Do they know the specific rules of language? (“When you’ve got one cat, what do you say when you have two of them?”) Can they put a grammatically correct sentence together or sequence a series of events in the correct order to tell a story? Once we’ve identified the problem, we’ll target the appropriate word or sentence structure problem—how to make a singular word into a plural, or how to make sure their sentences have nouns and verbs, and how to use them in the correct sequence in a story or conversation. 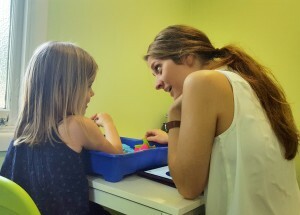 Once the therapy is complete they’ll be able to have age-appropriate conversations without being accused of “talking like a baby.” They’ll be able to ask and answer questions confidently, both in the classroom and at work, and instead of struggling with a problem, they’ll be able to ask for help and get it resolved. One of our Kids Chatter kids, who was struggling with both his language and literacy skills in primary school, attended therapy for three months. By the end of his therapy journey, his results had improved by 13 months with his school work and he has continued to do well in school ever since. We can achieve similar results for your child. If you feel that spoken language problems may be holding your child back, please call us today to discuss your child’s needs on 0432 735 044.